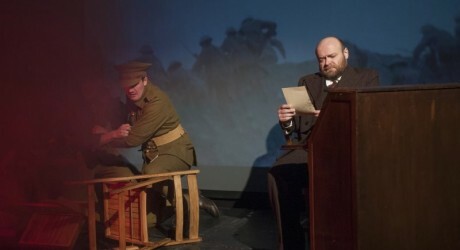 FOLLOWING on from the success of its national tour earlier this year, Sequamur, the highly-acclaimed Gaelic World War One theatre production, will be at the Edinburgh Fringe Festival from the 18th to the 24th of August 2015. Sequamur – written by Isle of Lewis writer Donald S. Murray – tells the poignant story of William J. Gibson, who was rector of the Nicolson Institute in Stornoway between 1894 and 1925. An enlightened and charismatic teacher, Gibson believed in the power of progress through education. He genuinely believed that service in WWI would bring a new enlightened age to Britain – but endured personal turmoil following the death of 148 of his own pupils. The 60-minute play is performed in Gaelic but is designed to be fully accessible to all, with live simultaneous translation via headphones for people who do not speak Gaelic. Erica Morrison, creative director at Pròiseact nan Ealan, said: “The international audiences which attend the Edinburgh Festival will discover a thought-provoking drama which transcends language boundaries. C.C. Het Peron Cultural Centre, Ypres, Belgium, Friday 4th September, 8.30pm. Pròiseact nan Ealan (PNE), The Gaelic Arts Agency, was established in 1996 as a company limited by guarantee and a registered charity. PNE is the lead strategic body in Gaelic arts; it has a dual role as a Gaelic arts production company and networking infrastructure body and has a strong track record in delivering successful, high-quality and award-winning arts projects. PNE is working nationally and internationally across diverse art forms on projects that have multiple funders and are at varying stages of development. MEDIA RELEASE issued by Media House International. You too can post your story ideas for journalists (aka press or media releases), on allmediascotland.com. Email here for more information. Check out too twitter.com/allTheatrePR and twitter.com/allEdinburghPR.